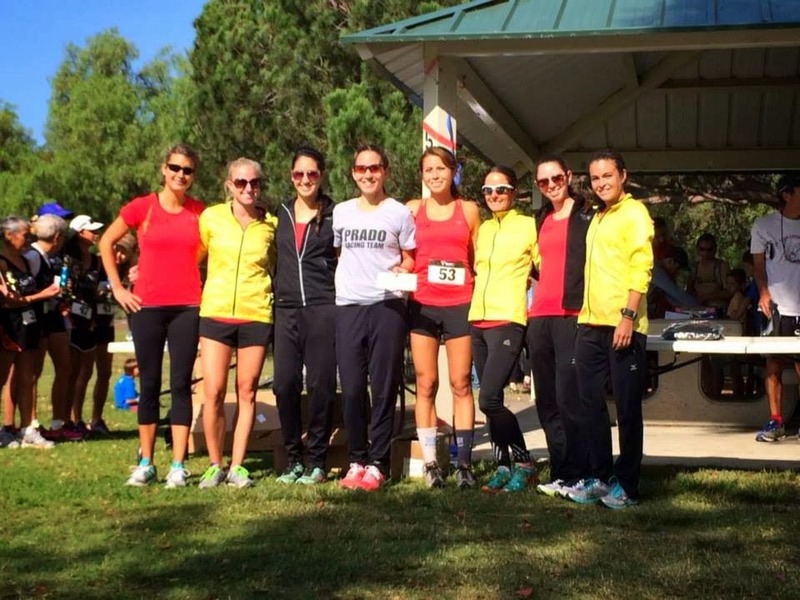 The women of the New Balance Prado Racing Team wrapped up 2014 with team victories and multiple personal records. 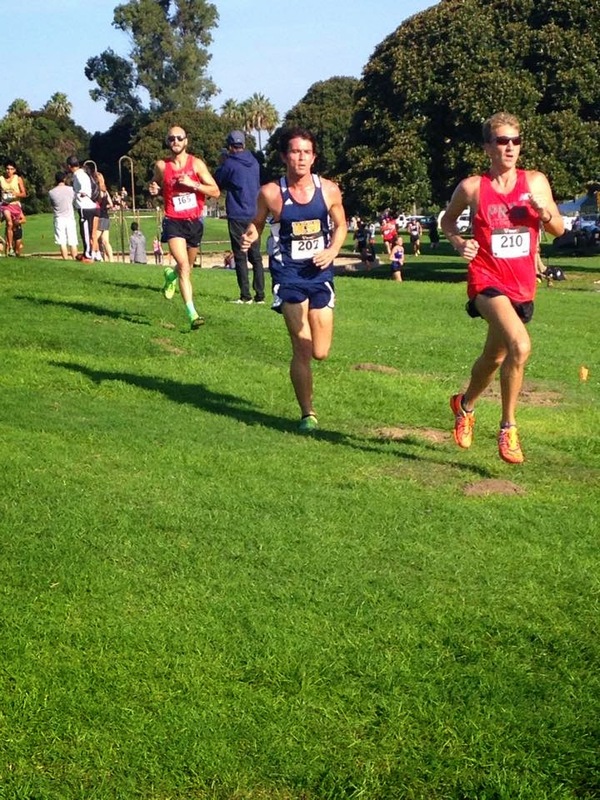 June is usually a somewhat slow month for the PRT men's team, but it did feature two performances of note: Derek Bradley's 4th-place finish (15:31) at the very competitive Bonita 5000, which also put him second in the race-within-a-race SDUSATF 5K Championships; and Thomas Whitcomb's sub-1:10 half marathon at the San Diego Rock n Roll Half Marathon. Andrew Corman, Chuck McKeown, Alex Phipps, Mike Christman, Luis De La Vega, and Mike Daly all finishing within the top 20. 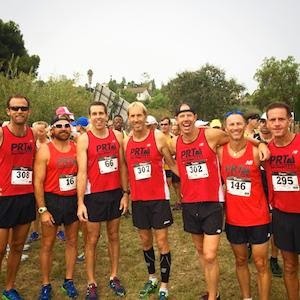 After the typical mid-summer break that follows Scripps Ranch, the PRT men reconvened this past weekend to kick off the 2014 SDUSATF Dirt Dog XC Series. The first race of the morning was the Masters race, in which seven PRT men competed. Stephen Johnson took first (16:54), closely followed by PRT Men's Team Captain Brian Culley (17:03). They were followed by Greg McMillan (5th, 17:18), Jason Lewis (6th, 17:21), Sean Fader (9th, 17:39), Joel Bernard (11th, 18:06), and Gerard Reski (16th, 18:45)— a strong team showing. 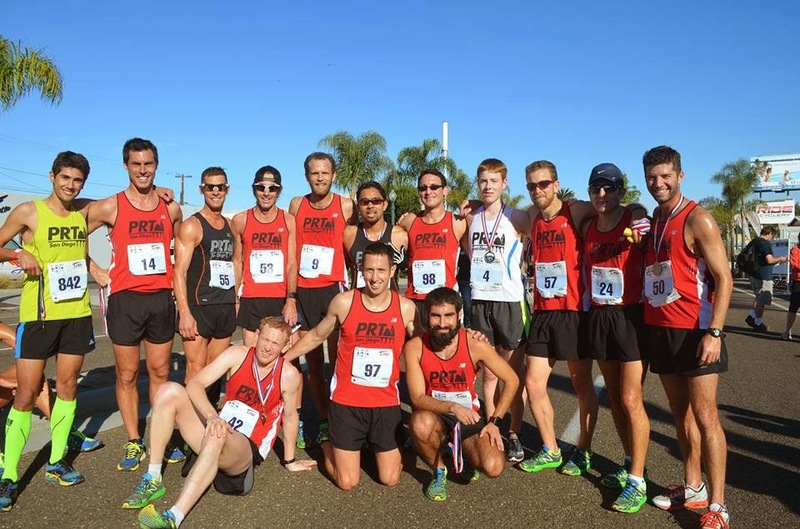 In the Open race, the PRT men faced tough competition from Milestone Track Club and San Diego Track Club, but ran well as a team, taking the sixth through ninth spots (Phipps, Seidel, Whitcomb, McKeown, all between 16:13-19). 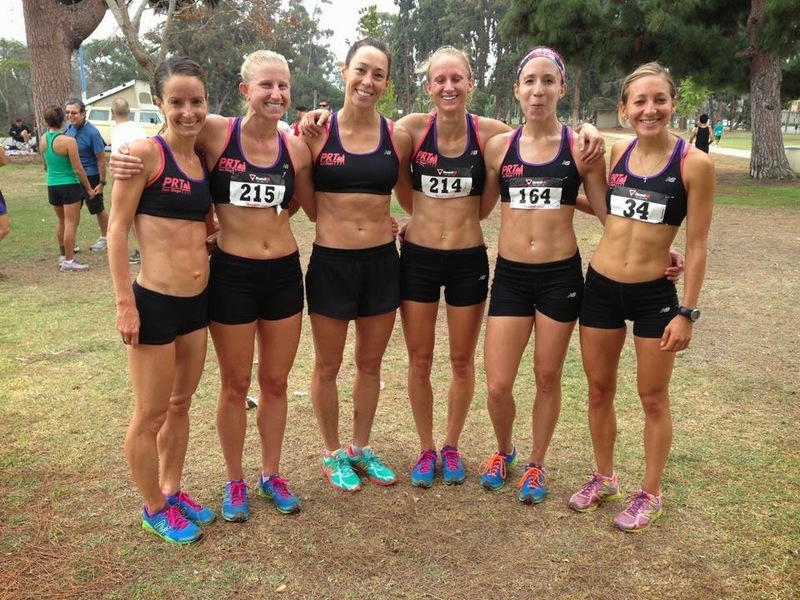 The women of New Balance Prado Racing Team have been busy training and posting new PRs. The late spring and early summer season have seen PRs in events ranging from the 5K to the Marathon! Our first PR is over the longest distance, the marathon! Despite battling injury going into the race, Kristin Schleicher still managed to pull off not only the top overall female position but also notched a new Marathon PR of 3:01:34! Julie Sawyer took a break from her Spring track season to run the Portland Rock and Roll Half Marathon and snagged 5th place overall as well as cut down her Half Marathon PR by almost three minutes to 1:20:07. New teammates Cortney Staruch and Bekki Miske wasted no time putting some fast times up on the board. Cortney raced both the Vista Strawberry 5K in 17:50 and the Bonita 5K in a PR of 17:28 (also good for second place overall), and Bekki competed in the Vista Strawberry 5K in 18:30 and the next week ran a PR of 18:09 (on a long course!). 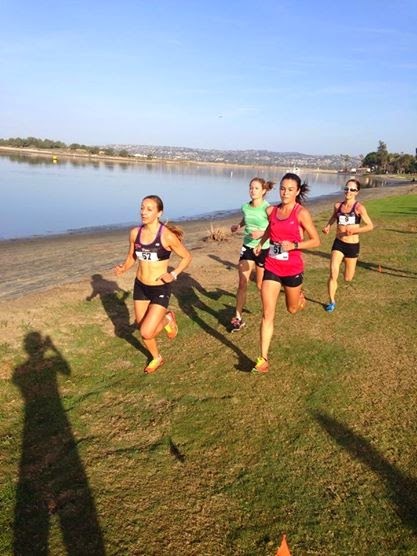 Several PRT women decided to kick off the summer by competing in the San Diego Rock and Roll Half Marathon and Marathon. In the Half Marathon, every woman ran her fastest half marathon time ever to make for a very exciting day for the PRT women. Hilary Corno ran a blazing 1:19:01. She was followed by Angela Moll in 1:22:14 and Darcy Davidson, who cut over a minute off her previous best time to run 1:22:57. Additionally, Sara Sanchez braved the marathon to post a solid time of 3:10:23. While many runners were taking a break from the Spring season, the PRT ladies had a strong showing at the Old Pro’s Scripps 10K on July 4th. The women claimed four of the top ten positions, led by Hilary Corno in 36:11 good for second female overall. She was followed by Jenna Munguia who finsihed third in 36:23 in one of her first races back. Quite an impressive showing! Darcy Davidson (37:38) and Gina Merchant (39:51) rounded out the top ten finishes in 5th and 7th, respectively. 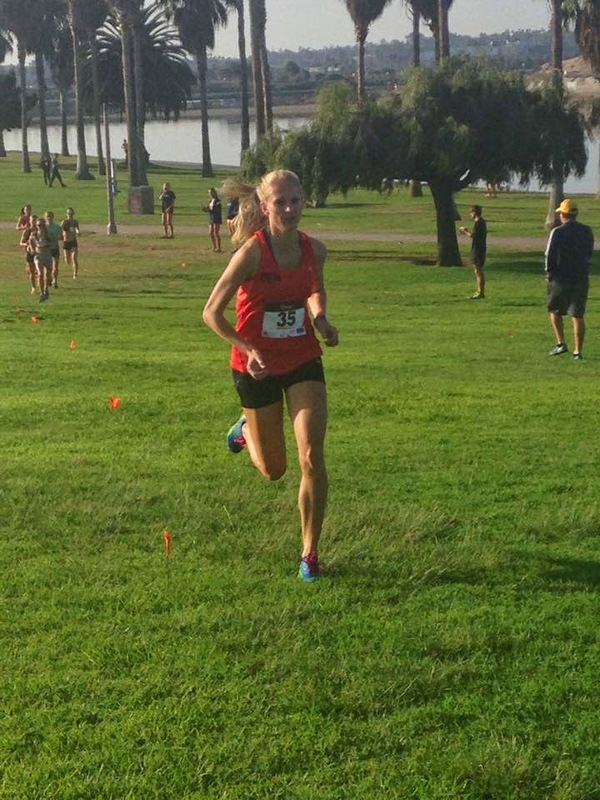 Also competing for PRT was Kelcie Wiemann (40:48) who took a break from studying for the California Bar to lace up her racing flats! 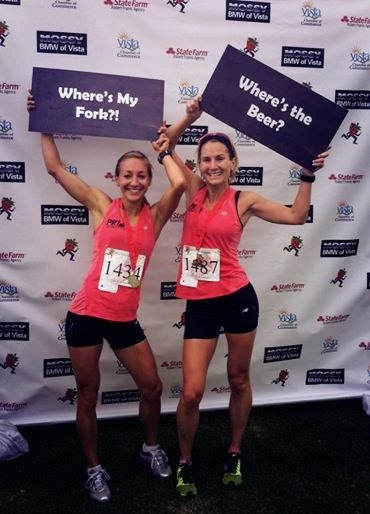 Most recently, two of our women braved hot and muggy racing conditions at America’s Finest City Half Marathon. 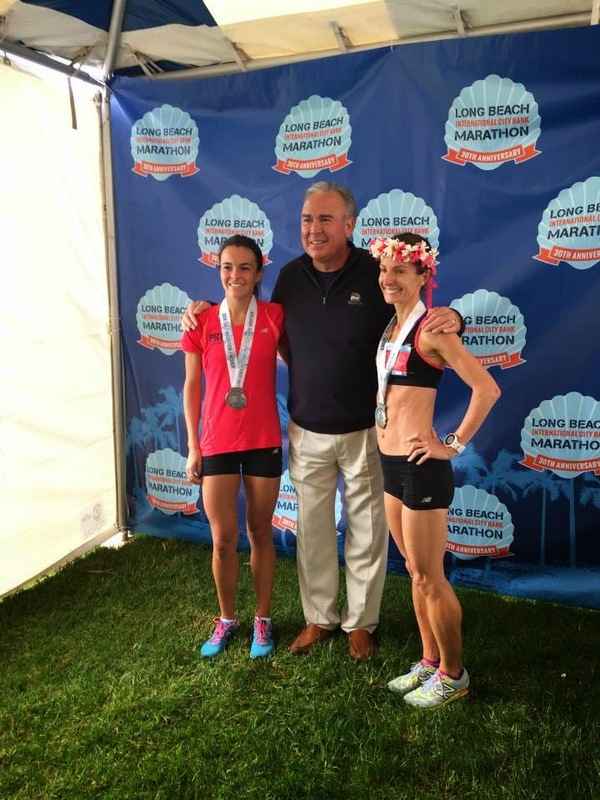 Despite less than ideal weather, both women toughed it out, with Caela competing in her first half marathon in several years, finishing with a time of 1:25:01, and Hilary Corno finishing in 1:21:04. The women of the New Balance Prado Racing Team have been busy this spring! 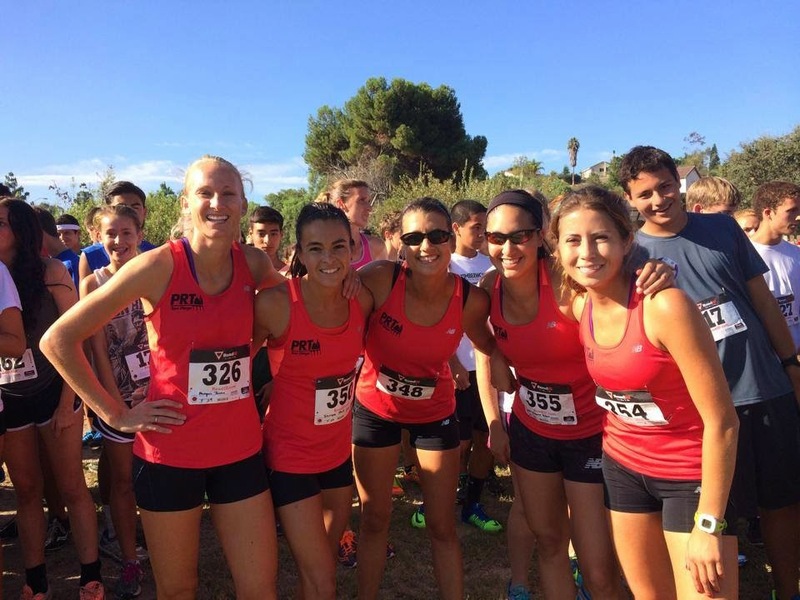 The ladies have participated in several road races as a team, once again displaying PRT's dominance in the San Diego running community. 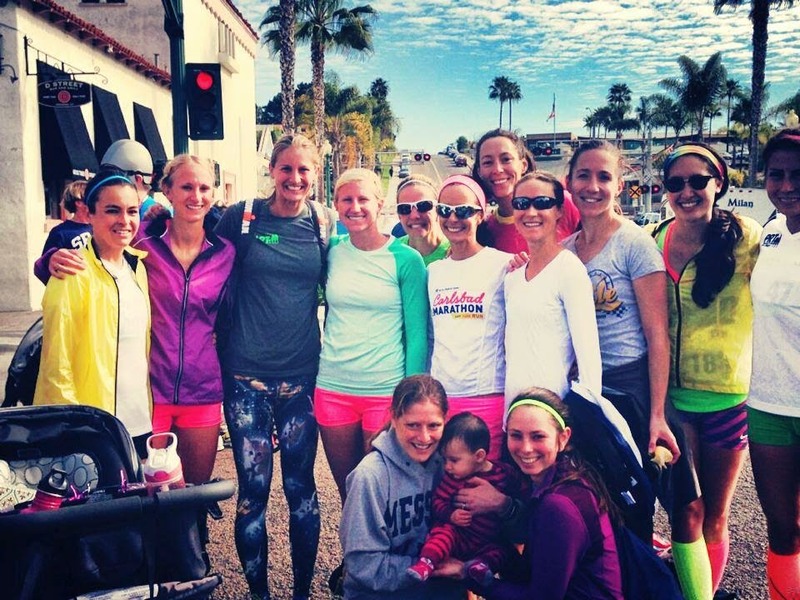 On March 16, the PRT women participated in the inaugural Encinitas Mile, a unique road race challenging runners to draw on their speed over the course of a one-mile out-and-back course along Vulcan Avenue in Encinitas. Runners were divided into heats, and the PRT women participated in the Elite race, the Women's Open division, as well as the Dog Mile! In the Elite race, speedster Gina Merchant led the team finishing third in 5:13, holding off teammate Julie Sawyer, who couldn't match Gina's powerful kick. Sawyer (5:14) was followed by Kristin Schleicher (5:18) and Hilary Corno (5:23), whose performances were even more impressive given that both women are training for much longer (marathon and half marathon, respectively) races. The PRT Women were also impressive in the Women's Open division. Sam Espinolda snagged first place in a time of 5:35, followed by teammate Nancy DiBenedetto in third (5:44), Jordana Henderson in fifth (5:45), and Kelcie Wiemann in seventh (5:49). 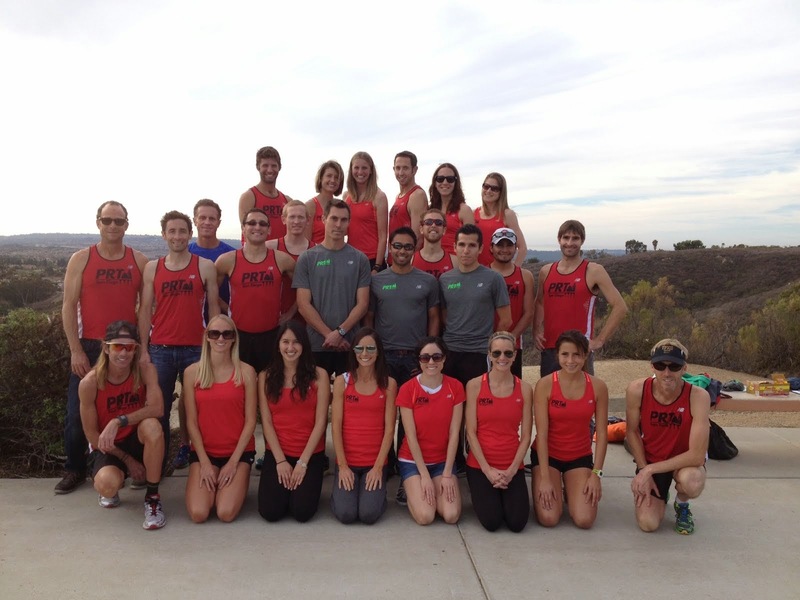 The entire team was honored to be part of this new and exciting event and look forward to racing the Encinitas Mile again in 2015! 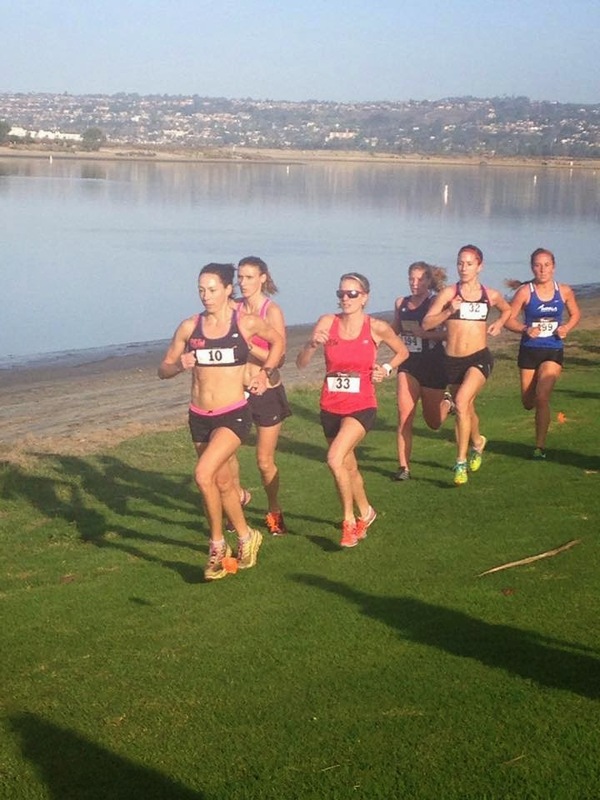 Two weeks after testing their speed in the mile, the women participated in the Carlsbad 5000. Leading the team in a time of 17:33 was Hilary Corno, good enough for third in the Women's 30-39 division. She was followed closely by Kristin Schleicher (17:35, a new PR) and Sawyer (17:36). Together, the three women combined for the fastest Women's Open team, beating out the nearest competition by over a minute (scores are calculated by taking the combined time of the three women on the team). Also in the Women's 30-39 division, Gina Merchant had a breakthrough 5K race, finishing in 18:04, a huge PR! In the Women's 29-and-Under race, Kelcie Wiemann (19:39), Sara Sanchez (19:53), and Nancy DiBenedetto (21:12) combined for a team score earning them fifth place in the Women's Open division. 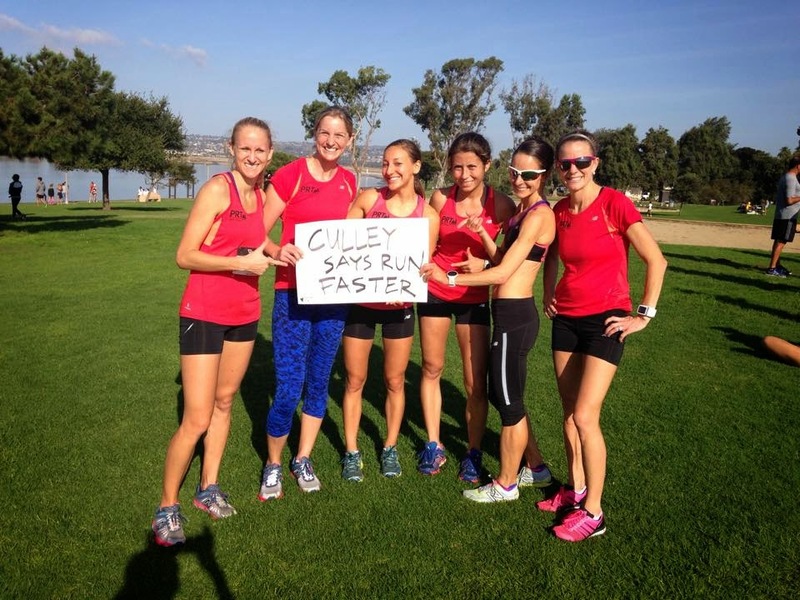 In addition to the team-focused races, many PRT women have been chasing PRs in other events. 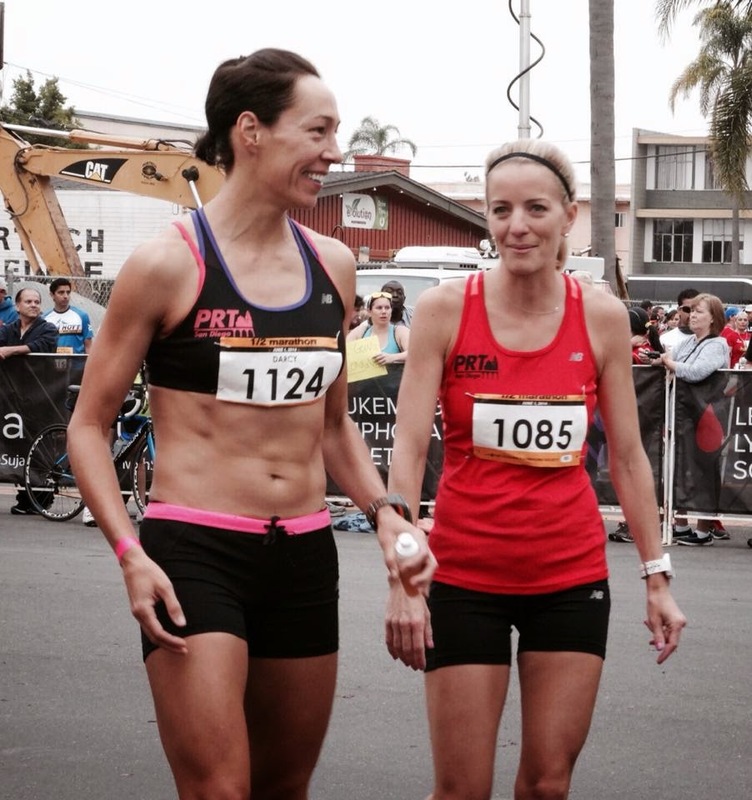 One such notable performance this winter was Hilary Corno's PR in the Carlsbad Half Marathon in January, finishing in 1:19:25, which got her fifth place overall. Recently, Marie Schaper went big and traveled all the way to London to run the London Marathon. Her finishing time of 2:48:55 was a seven-minute PR. She was also the top American woman to finish the race and 12th overall! Finally, Angela Moll traveled back east to participate in the Boston Marathon and finished with a PR of 2:55:44, finishing in the top 100, not an easy task at such a prestigious race! There are still some more spring races to come, so expect future updates on more PRT New Balance PRs! The spring season of 2014 has seen the PRT New Balance men turn in some impressive performances so far. There have been five team-focus races: the Cardiff Kook 10K, the U-T 10-20, the Encinitas Mile, the Carlsbad 5000, and the Fast Times 5K—a range of distances in which the men have excelled and demonstrated their versatility. The Cardiff Kook Run in February, an out-and-back course that was held for the first time entirely on the 101 Coast Highway this year, always features a quick first 5K and a challenging second half coming back north. The men were led by Eduardo Mariscal (5th place, 32:46), followed by Daniel Farmer (6th, 33:06), Brent Varga (8th, 33:24), Alex Phipps (9th, 33:41), and Andy Corman (10th, 33:52). Team captain and Masters runner Brian Culley turned in a sub-34 10K for 11th place, beating some of the Open men in the process. A couple of weeks later, the U-T 10-20, a new 10-miler race primarily along the coast from Del Mar and Solana Beach down to Cardiff and back, drew a strong field of elite runners with its ample prize money. The PRT men started with the non-elite field and took all three top spots (Derek Bradley, Dan Seidel, and Andy Corman). Finishing 7th, 8th, and 10th were Brian Culley, Robert Verhees, and Matt Sheremeta. Another inaugural event, this one calling on some faster-twitch muscle fibers, was held on March 16. 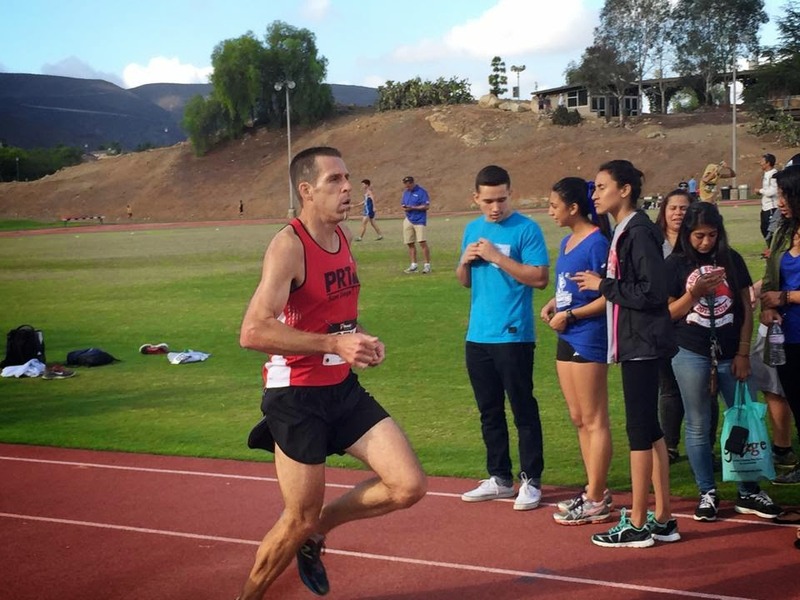 The Encinitas Mile featured PRT men running in four of its eight heats (Masters, Open Men, Elite, and Dog Mile). In the Masters, Robert Verhees (2nd, 4:50), Brian Culley (3rd, 4:55), Sean Fader (5:05), and Matt Sheremeta (5:07) all turned in strong performances. Also of note was the turnout in the Elite (sub-4:40) heat: Derek Bradley (6th, 4:31), Mike Christman (8th, 4:33), Alex Phipps (9th, 4:33), and Chuck McKeown (10th, 4:38) all beat the elite standard and mixed it up with some of the top local elite runners. 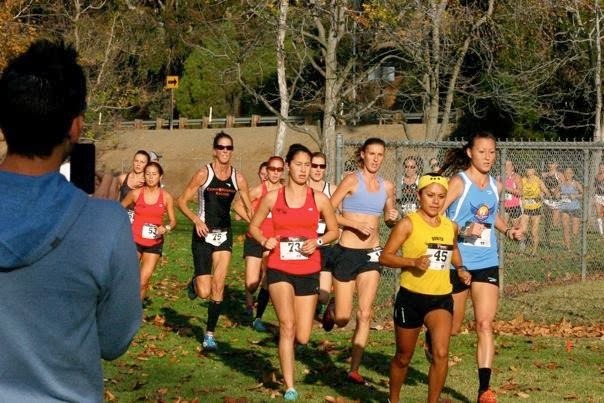 A similar scenario played out at the Carlsbad 5000, one of the premier road races of the year. Masters runner Robert Verhees ran a simmering 16:25 in the early 40+ race, and in the 30-39 age group, Derek Bradley (15:28) took fifth and ran sub-15:30, which is always impressive on Carlsbad’s deceptively difficult course. Bradley was followed by Dan Seidel (15:41) and Andy Corman (15:51). In the 20-29 division, Daniel Farmer ran with this customary aggression, and finished with a team-leading time of 15:22, while new member Thomas Whitcomb ran a very solid 15:45. Chuck McKeown PR’d in the 5K, breaking 16 minutes in the process. The Fast Times 5K in mid-April was thoroughly dominated by the men’s squad. PRT New Balance took the first eight spots, led by Daniel Farmer, who won the race in 15:29. He was followed in short order by Derek Bradley (15:36) and Alex Phipps (15:41), and then by Eduardo Mariscal, Dan Seidel, Chuck McKeown, Brent Varga, and Charlie Frishberg. On the Masters squad, Matt Sheremeta, Sean Fader, and Joel Bernard took 14th, 15th, and 16th respectively. 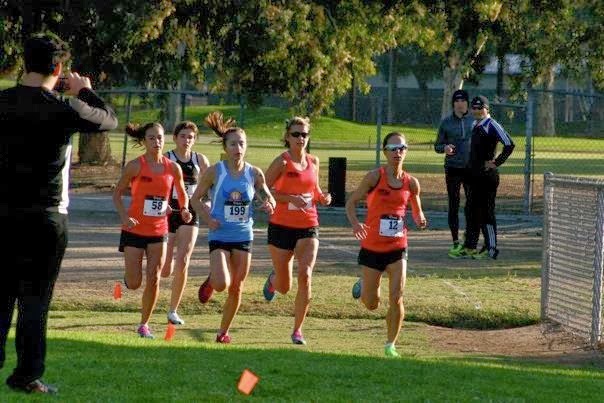 The next team-focus race for the PRT New Balance men will be the Scripps Ranch 10K in July, a very fast loop course around Miramar Lake followed by a screaming downhill finish. The women of Prado Racing Team continued their dominance in the Dirt Dog Series this past Fall by winning the Women's Open Division and placing 5 women in the top ten individually in the series standings. The PRT Women came into the series as the defending 2011 and 2012 champions with a perfect score of 60 points, having won three races as a team throughout the series. Much of the team's early success depended on the motivation of its members, who were committed to showing up to races throughout the Fall season so that the team was able to field a full team at four out of the six regular season meets, as well as a squad of eight women at the championship meet itself. Hilary Corno led the team and the Dirt Dog series standings going into the Championship meet. She had a solid season winning the Bonita Stampede 5 miler and placing second in both the Wild Duck 5-K and Bonita 4-miler. All this while training for (and winning) the Long Beach International Marathon in October. 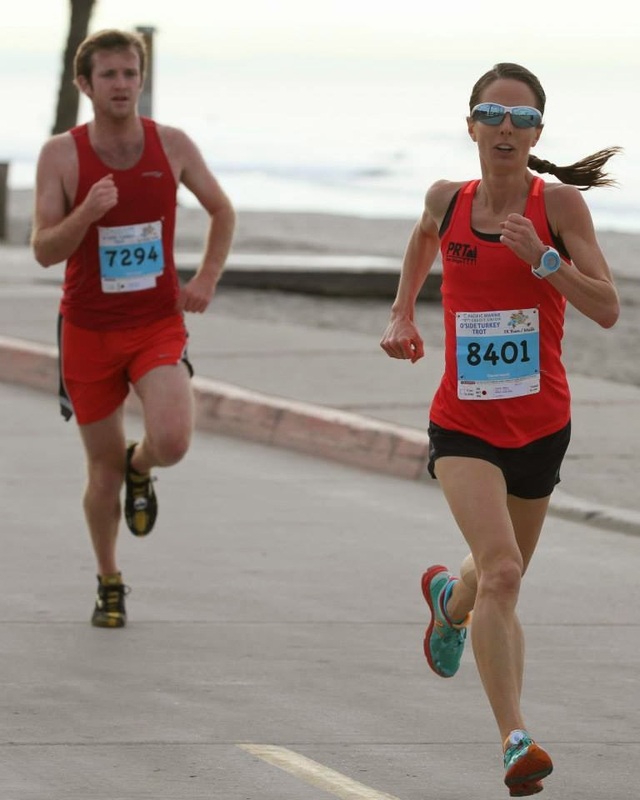 When the gun went off for the three-loop 6-K Championship race, it was Marie Schaper who stepped up to lead the team to victory, running a gutsy race to finish second only a week after finishing second overall in the Santa Barbara International Half Marathon. Following Schaper was Corno in third, Sawyer in fourth, Timinsky in seventh, Merchant in ninth, Sara Sanchez in 17th, Kelcie Wiemann in 18th, and Jordana Henderson in 31st. The women's combined score of 15 points was enough to clinch the victory for the third year in a row. swept the top three places in the individual standings for the Dirt Dog Series. Due to Corno's commanding lead in the series standings, she held on to her overall victory to become the Dirt Dog Series Individual Women's Open Champion. Additionally, the PRT Women swept the top three places, with Sawyer finishing second overall and Schaper finishing third. Rounding out the top ten were Merchant in seventh and Timinsky in eighth. 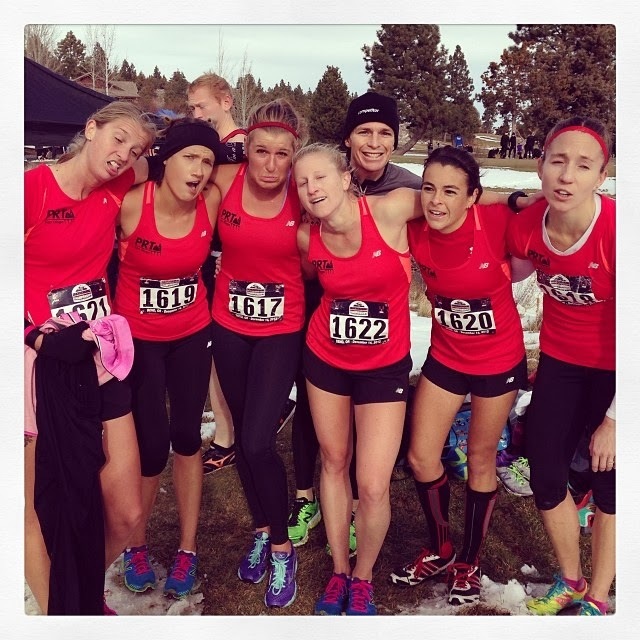 After the conclusion of a successful San Diego Cross Country season, many of the women weren't done racing, and a team of six women (Kristin Schleicher, Julie Sawyer, Liz Johnson, Caela Timinsky, Marie Schaper, and Gina Merchant, pictured below) traveled up to compete in the USATF Club Nationals Cross Country Championships in Bend, Oregon. There the women competed on a "true" cross country course, complete with ever-changing terrain, hay bales, and snow. In their first showing ever at the national level, the team placed 22nd out of 34 teams in a very competitive race. After a very successful season, the PRT Women look forward to future success in the Spring of 2014! Content copyright 2011-2012. Prado Racing Team. All rights reserved.. Simple theme. Powered by Blogger.